Joel Prior is a trained professional who has mastered the art of car detailing. 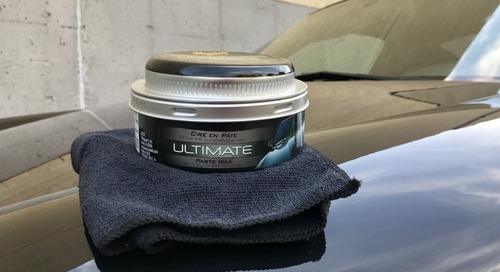 Joel works closely with car collectors, dealerships, body shops and automotive companies across Canada and is the official detailer for Meguiar's Canada. Joel began working with Meguiar's® in 2007 and established his own car detailing business, Showcar Detailing, in 2008. Showcar Detailing is a mobile detailing business that specializes in professional detailing, from the reliable family vehicle to collectible and exotic cars, using only the finest Meguiar's® brand products. Help stay safe this winter with clear headlights! Your car safety checklist for winter driving can get lengthy. Alongside big-ticket items like tires, headlights are often overlooked. 1. Has your vehicle clocked over 200,000 km? 2. Do you have stone chips and/or debris on your vehicle? 3. Do you park your vehicle outside all year round? If you answered “yes” to any of these questions then you should make headlight restoration a part of your winterizing car safety checklist. Visibility is a critical safety component for winter driving – yellow and hazed headlights can reduce your ability to see clearly on the roads. Clear headlights help to ensure your lights are projected to their fullest in hazardous weather conditions. How do you get clear headlights? 1. Which headlight restoration product is best for oxidized headlights? For extremely oxidized, scratched and yellow headlights, I would recommend Meguiar’s ® Heavy Duty Headlight Restoration Kit. This kit has all the bells and whistles. It includes all the proper abrasives and finishing protectants, like the sanding pad and finishing discs, drill pad, PlastX™ Cleaner, headlight protectant and a microfibre towel. 2. Which headlight restoration product is best if you don’t have a lot of prep time? The Meguiar’s® Perfect Clarity™ Headlight Restoration Kit is a great option for the person on the go and for headlights with mild oxidation. I love its simplicity. You can have clearer headlights in just two steps – clean and coat. 3. Are headlight restoration kits easy to apply? If you’re a do-it-yourself kind of person, the Meguiar’s® Heavy Duty Headlight Restoration Kit and the Meguiar’s® Perfect Clarity™ Headlight Restoration Kit are a great weekend project. You don’t need to be a professional detailer like me to use them. But, if you wouldn’t consider yourself advanced, don’t be afraid to give Meguiar’s® Perfect Clarity™ Headlight Restoration Kit a try – you may surprise yourself. For more quick tips, check out the Meguiar’s “How To” page.